I was on a PKW (Pregnant Korean Wife) craving run at the store when I came across a box of cookies that had this in hangeul. Oooh, “Gallic Pie!” Some super French pastry–hey! 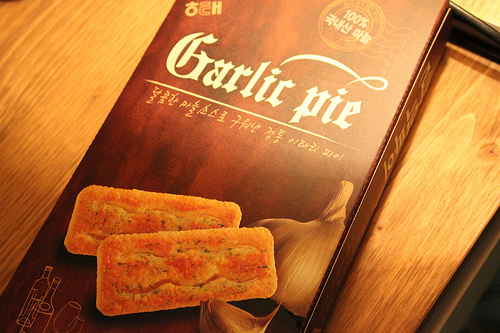 What’s that clove of garlic doing there… whut… uh… mm… no. It can’t be! I turned it over and saw the English title at the top. I had to buy the box to see if it was true. This goes back to one of my pet peeves about modern Korean foods. There is a documented tendency for cultures to sweeten foods adopted from others. But sometimes I think Korea goes a bit overboard. It’s very difficult to find buttered garlic bread without a good handful of sugar thrown on it. The tomato juice is sweetened–sometimes turned into popsicles. Bacon and egg toast comes with a heaping dollop of kiwi sauce if you don’t stop the lady in time. Corn dogs are covered in sugar. Pizzas are piped with sweet potato mousse. Burgers come with syrupy sweet bulgogi sauce. And most all western food comes with the ubiquitous sweet pickles. Okay, I’ll say this. I like the texture. Mostly sweet and not much garlic. Overall the thing ain’t that bad if it wasn’t for the lingering hint of garlic–a lingering hint that grows after you eat it, leaving your mouth vampire proof for an hour. There. I tried it so you didn’t have to. That’s the service we provide at the ZKFJ. ROTFLOL! Joe, did your beloved try some too or was the idea too gross for her too? I completely agree with you regarding how a lot of foods here tend to go overboard on the sweetness. I have more of a “salt tooth” than a sweet tooth anyway, and definitely don’t appreciate sweet foods masquerading as savory. Case in point: the garlic bread here, like you mentioned (I’ve only tried the kind from Tous Les Jours, and that was bad enough to put me off trying someone else’s. I make my garlic bread at home now). On the subject of garlic: Have you seen/tried the garlic doughnuts at Dunkin’ Donuts? I have a picture of them that I was just about to post. For good garlic bread without sugar, I do like the garlic baguettes at Paris Baguette.